The cold wind was blowing softly from the east and there was a mixture of fog and haze compliments of the East Bay. A lazy, hazy cloud cover served as a canvas for the early morning sunlight that cast a peachy glow in the sky and, consequently, all the way to the ground; this was before the actual sunrise. I took a few pictures but no camera can capture the full ambience. It was a rare and joyous moment that I experience a few times a year, but sadly it lasts for only 10-15 minutes. 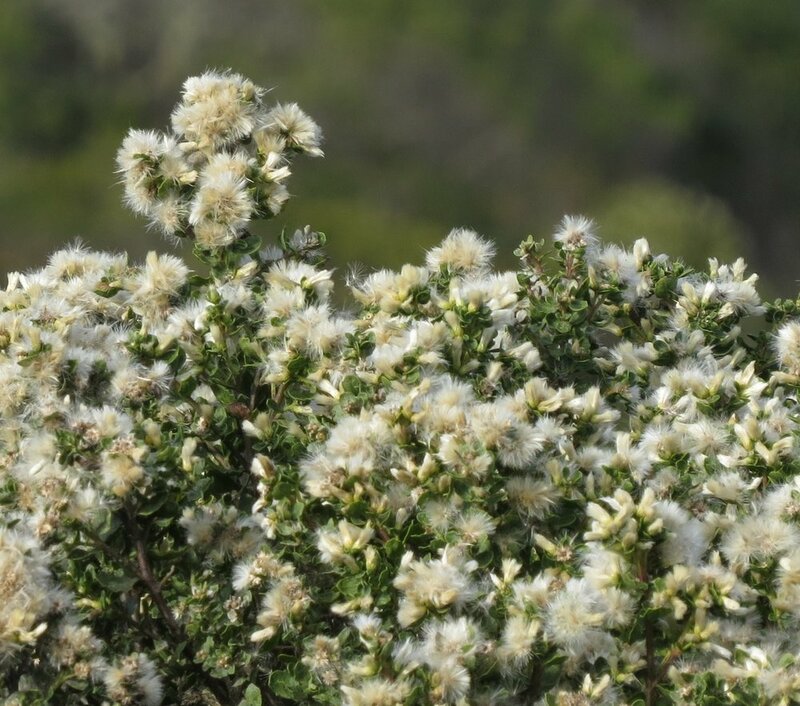 October and November celebrates the full glory of the female coyote bush with her white and fluffy pappi that are attached to the achenes, awaiting a stiff breeze to blow the seeds away. Looking south from the Guadalupe Trail reveals the female bushes as puffs of white on the mountain across Colma Canyon. Winter also exposes the huge communities of snow berry in the canyon. Since it is deciduous and rhizomatous the communities appear as amorphous, dark mahogany patches that dominate the color scheme of scrub. Snow berry is very photogenic in early winter with its thin bare branches and snow-white berries. Discovering new species is especially exciting, as is finding new locations for extant species. This interesting story began on December 3, 2016 and there is a backstory to help unravel a mystery. Elizabeth McClintock and Walter Knight were the primary authors of two published floras of the San Bruno Mountains along with a third author; Neil Fahy (1968) and Paul Reeberg (1990). The first was part of The Proceedings of the California Academy of Sciences, a rather large tome since the flora spanned pages 587-677. In 1990 an expanded flora of 223 pages was published primarily to document plant species before impending development destroyed habitat. In January 2013, David Nelson and I began working on an updated version, The Natural History of the San Bruno Mountains complete with color photographs. One of the joys of writing the book is the field research that we do almost every Saturday. We decided it was time to find salal (Gaultheria), a member of the heather family that includes manzanitas. The 1990 Flora said it was in “Cable Ravine on rocky outcrop above Eucalyptus grove.” After visiting every rocky outcrop and coming up empty we pushed onward toward the top of the ravine. We were off the Summit Trail near a small grove of pine trees when David summoned me over to look at something at his feet. “That’s suborbiculata!” I shouted enthusiastically. We had found a new and shockingly large population of a form of bearberry manzanita, Arctostaphylos uva-ursi forma suborbiculata, Miniature Manzanita. In 1968 there were no recognized forms of uva-ursi, the only species of manzanita that has made it around the world. By 1990 there were eight forms recognized internationally. Five forms are in the California Floristic Province, which is home to all the manzanita species. Three forms are present on San Bruno Mountain and two are endemic, including our new discovery. Quite special for such a small area. A month after the discovery I looked in the 1968 Flora for Arctostaphylos uva-ursi. Several locations were given including one that read “Cable Ravine, about 30 yards from the Monterey pine, largest colony on mountain.” This obviously was the location we had found. In the 1990 flora under A. uva-ursi forma suborbiculata the location given was “their only locality on Kamchatka Point.” My first thought was why Elizabeth failed to list this form of manzanita which was also in Cable Ravine. In 1968 the authors mentioned “on Kamchatka Point there is a low-growing form with small suborbicular leaves borne on assurgent branchlets coming off of cord-like branches which are absolutely prostrate.” Somehow the authors did not even mention the endemic Cable Ravine population in the 1990 flora. It was completely forgotten. So, the two of us identified a new location for the endemic miniature manzanita. The etymology of suborbiculata is Latin for “almost round and flat or disk-shaped”, referring to the leaf blades being suborbicular; somewhat concave instead of convex. The leaf and branching of this form of uva-ursi is quite unique and striking when compared to the very common form coactilis which is found in seven California counties; Del Norte, Humboldt, Marin, Mendocino, Monterey, San Mateo, and Sonoma. Beginning last October two very good things began to happen. Steady rain totals of 3.53 inches in October, 2.57 inches in November, 5.07 inches in December and 9.77 inches in January plus cold weather with lows in the 30s and 40s should bode well for spring wildflowers. One big surprise for me was discovering a sky lupine in full bloom on the Bog Trail on Thanksgiving Day!!? In late January, we saw patches of blennosperma, a small yellow flower, blooming on the lower ridge of Owl Canyon. I expect to see huge patches of yellow blennosperma in upper Owl Canyon in a few weeks. A walk down a grassy ridge under the East PG&E Powerline in Brisbane Acres a week earlier treated the eyes to hundreds of milkmaids. Buttercups, San Francisco wallflower and toyon berries also provided a lot of joy. The blustery storms in late January brought down a large trunk of a California bay tree, blocking a trail in Owl Canyon where it crossed a swollen creek, which was raging with water from the ridge. The creek had several waterfalls cascading 15-20 feet from sudden drops located halfway up the canyon. Makeshift creeks ran down from the Day Camp, across and down the Old Guadalupe Trail to a collection box over a hundred yards away and down the hill to Colma Creek. The lower Bog Trail became a small creek and even walking to the sides of the trail produced squishy sounds under my shoes. I did get some awesome videos of water running in areas that I hadn’t seen since 2010. Even the gopher holes were gushing and Colma Creek was flush with fresh water. Newer PostThe Mountain Has Voles! Older PostRains Bring Winter "Wonders"